Today’s Gospel begins with Jesus posing a question to one of his Apostles. Philip probably wasn’t thinking at all about the needs of those around him before Jesus put the thought into his head. More likely, Philip was thinking of his own needs and concerns, maybe thinking about what he was going to have for lunch, or how he was going to get any rest and relaxation and quality time with his friends with these thousands of people making all this racket around him. But Jesus breaks through all these selfish thoughts and forces Philip to think beyond his own needs. And my brothers and sisters, it’s not long after we start to follow Jesus that He begins to put thoughts into our heads and hearts that force us to look beyond our selfish needs and wants. Questions that only Jesus could have put in our hearts, that we would never have thought of if he didn’t put it there. We as individuals and as a society can do nothing apart from Jesus, but with Jesus we can do everything – nothing is impossible for he who has faith says the Lord. In some ways this is the main point of Our Holy Father Pope Benedict’s new Encyclical Letter Caritas in Veritate, which came out earlier this month. The Pope is reminding people that all the many challenges the world faces, whether it’s third world poverty or the financial crises in America and Europe, these challenges cannot be solved apart from the Truth which is Jesus Christ and His Gospel. With Jesus, we can feed the hungry, make peace with our enemies, overcome sin and injustice, even solve difficult economic problems. We will be as surprised as the Apostles were when we see what Jesus will do next. In today’s Gospel we read about the return of the Twelve Apostles from the first mission Jesus sent them on. In last Sunday’s Gospel, we read St. Mark’s account of Jesus sending forth the Apostles into the nearby villages to heal the sick and to preach repentance. And just as Jesus sent the Apostles, so He also sends us forth from this Church to our homes and neighborhoods and places of work, to do what the Apostles did: to bring Christ’s healing love to all we meet, and to convert our neighbor or co-worker by our good example in words and deeds. As I’ve mentioned in another homily a while back, we commonly call what we are now doing “The Mass.” And the word Mass literally means “The Sending Forth.” We come before Jesus present to us in the Blessed Sacrament, He feeds us with His Body and Blood, and then “Ite, Missa Est” “Go, you are dismissed” — Jesus sends us away from Him into the world just as He sent His Apostles in last Sunday’s Gospel. And after several days of being away from Jesus’ bodily presence, the Apostles come back to Jesus, just like we have come back to Him after being sent forth from Him last Sunday. And judging from the account St. Luke and St. Mark give about the return of the Apostles, it seems as if it had been a pretty rough week for them. Based on the scriptures, the Apostles seem to come back feeling like they by and large failed to convert the people Jesus sent them to. It seems this way, because in no Gospel does it say the Apostles returned to Jesus rejoicing over their success. Instead, Mark says they returned to Jesus and reported all they had done and taught. Jesus said to them “How did your week go?” and the Apostles reported to Jesus about it – they each told him how some people were converted by their witness, and how some hardened their hearts despite their good example. They each also reported to Jesus how well they followed Jesus’ instructions, but also they confessed to Jesus that at times they didn’t follow them, that at times were really a very bad witness to him and that was probably why some people didn’t convert. It appears that the Apostles must have come back to Jesus feeling discouraged, feeling like they’ve made little to no impact on the villages they visited, feeling like they’ve failed in the Mission Jesus gave them a week ago when He sent them forth. But Jesus doesn’t scold them for their failures. He doesn’t say “You go back out there and don’t come back until you’ve converted those villages”. Jesus rather says to them Come away by yourselves to a deserted place and rest a while. As if to say “I know you feel like you’ve failed. But you haven’t. Rather, you’ve been faithful this past week in doing my will. And those times this past week where you’ve been unfaithful, you own up to those sins and are sorry for them. And so my brothers and sisters in Christ, may we not get discouraged when it seems like we are failing Jesus, when it seems as if our good efforts at spreading the Good News don’t amount to much, when it seems that the world is winning the battle and we Christians are losing it. May we instead go to Jesus, and like the Apostles in today’s Gospel, may we pour out our hearts to him, reporting to him all our successes and failures, all our sins and good works over the past week. And may we also take up Jesus’ offer to get some spiritual rest with Him, by setting aside quality time for prayer and meditation on the mysteries of our Holy Faith. You know, after Jesus sent out the 12 Apostles into the nearby towns and villages, and they came back to him feeling like they failed, some time later in his ministry Jesus sent forth 72 other disciples into those same towns and villages the Apostles had originally gone to. And St. Luke tells us that those 72 disciples came back rejoicing. Their mission was a great success – and it was all because the 12 Apostles had did all the hard work beforehand, laying the foundation. In the world we find ourselves in today, each one of us is called to rebuild those foundations of the faith, brick by brick certain that if we do, those who come after us will see Christ’s Kingdom again established on earth. 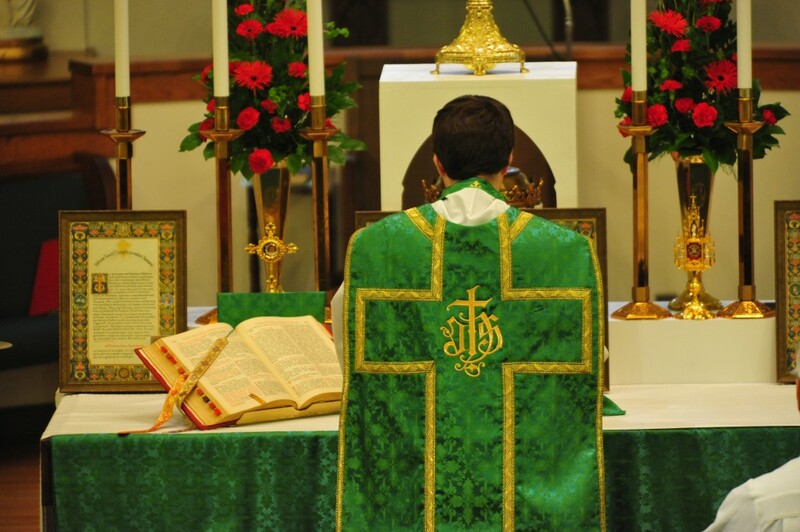 Here is a photo of the most recent Traditional Latin Mass at my parish. You are currently browsing the fatherwoolley.com blog archives for July, 2009.